hippity hoppity hop hop....the bunny has come. 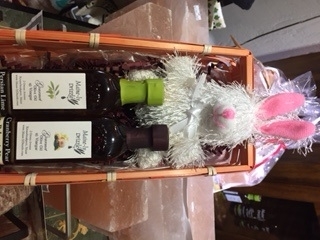 This is a beautifully packaged gift ready to leave at the end of the bunny trail. It includes the 2 oz bottles of Maine-ly Drizzle's Persian Lime Olive Oil and our Cranberry Pear White Balsamic Vinegar. Also included is a package of Easter themed decorative items.